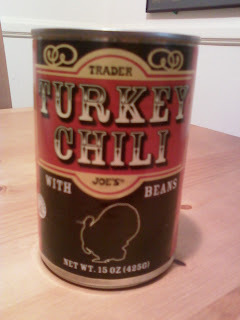 Trader Joe's Turkey Chili is pretty tasty. All of their chilis are good. They also have beef and veggie varieties. Turkey is probably my favorite, though. Sonia likes Vegetarian the best. The chili is a great value at $1.99, since it's enough for two servings and it's very filling. Turkey and beef have a decent amount of meat in them, and all three have a bunch of kidney beans. I could stand the sauce being a little spicier, but nonetheless, it has a good flavor. Just add some hot sauce or peppers to remedy its lack of kick. I give turkey and beef Four out of Five Stars, Veggie gets Three and a half from me...Sonia gives Four to both of the meat kinds and Five to Vegetarian. Oh, and the Vegetarian kind is organic. what would you pair this with to make a meal? fritos, monteray jack cheese, fresh cut tomato, onion and a dallop of sour cream. What about the chicken chili? Ps. Love all these... so good!